On January 22, 1973, the Supreme Court ruled that it was a women’s right to have an abortion according to the Fourteenth Amendment. The case was filed by a woman named Norma McCorvey, whose court alias was Jane Roe. She was opposing a Texas law that made abortion illegal, with the exception of saving the pregnant woman’s life. The case is known as Roe vs. Wade and is a major point of reference by people on the side of pro-life and pro-choice. Interestingly, in 1995, Norma McCorvey announced she had become a Christian and an avid pro-life advocate. She had spent many years heavily burdened over the 50 million abortions that had occurred in the U.S. since 1973. The Fourteenth Amendment says that no State shall “deprive any person of life, liberty, or property, without due process of law…” This clearly refers to the process by which someone’s life or valuables can be taken away, not what can or cannot be taken away. While this was used to defend a woman’s right to an abortion, our forefathers did not have this in mind when they created the amendment. The Fourteenth Amendment was ratified on July 9, 1868 during the post-Civil War era to protect the rights of recently freed slaves. The Supreme Court may feel that they can define human life, but the Bible is very clear on the subject. 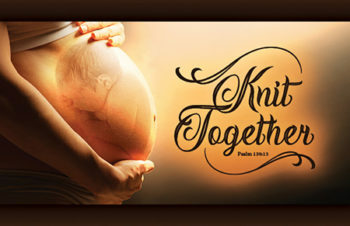 God knew us before He made us, which means that life begins before we are born. Exodus 20:13, one of the Ten Commandments says, “Thou shalt not kill.” There is no clause that gives acceptable reasons for disregarding this commandment. President Ronald Reagan, on the 11th anniversary of Roe vs. Wade designated January 22nd as Sanctity of Human Life Day. Reagan was a pro-life advocate who believed in laws to protect unborn babies. Several presidents have upheld this proclamation, but regardless, Christians continue to commemorate this day no matter who our elected officials happen to be. Lack of respect for one another has been a constant thread throughout our history. We do violence to someone simply because they have a different point-of-view from us. It is no wonder, then, that people care little for the life of an unborn baby. But God loves and cares about all life regardless of skin color, disability, or political ideals. Born and unborn. Sanctity of Human Life Day is one way we can bring attention to abortion and defend the lives of those who cannot defend themselves.